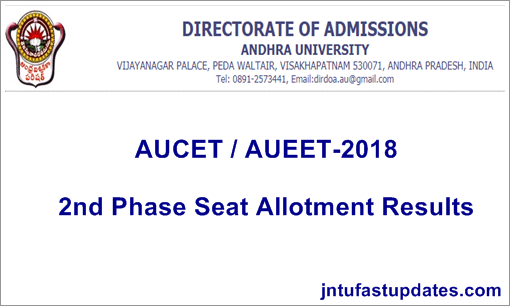 AUCET 2nd Phase Seat Allotment 2018: Andhra University has scheduled to release the AUCET 2nd round seat allotment results today, 29th June. Aspirants waiting for AUCET/AUEET seat allotment result (2nd phase) can check the result from the official website, audoa.in. The Andhra University has already done with first round of seat allotment process and now it is on a go to the AUCET 2nd round seat allotment process. The AU has released 1st round seat allotment list on 10th June and the fee payment process was carried out till 13th June. Most of the candidates cleared the AUCET with good merit have got admission in the 1st round. Now, the candidates who are waiting for the 2nd phase result can check it from today. The Andhra University is going to declare the 2nd round and 3rd round seat allotment process in the month of June/July and the commencement of classes will be from July month. Check more details from the following article. Andhra University, Visakhapatnam is one of the well-known universities of Andhra Pradesh. The AU offers admission in various UG and PG Courses. Candidates will be allotted admission into various courses based on the rank score in Andhra University Common Entrance Test. The AUCET is also called as AUEET. Annually, the competition is raising to get admission in Andhra University. The admission for the aspirants will be given purely on the basis of merit. This year the AU has organized the AUCET for a huge number of aspirants and released the results. The 1st round of seat allotment process for UG and PG courses has been completed. Candidates can now check AU UG PG 2nd round seat allotment result today, 29th June @ audoa.in. All the candidates those who do not get admission in the 1st round will have the chance to get admission in 2nd round and 3rd round seat allotment process. The AU has scheduled the 2nd round seat allotment result today and the fee payment process will be followed for the allotted candidates. Aspirants those who do not get the seat allotment in the 2nd round can get admission in 3rd round seat allotment process. The AU is going to complete the 2nd and 3rd round of seat allotment phases by June/July and the classes will be started in the month of July. Candidates who are waiting for the seat allotment results can check further details from the following. Candidates who got allotted the seat will have to download AUCET seat allotment order from the official website, audoe.in. Candidates also have to pay the admission fee during the announced dates. And candidates who do not get admission in the 2nd round can wait for the 3rd round seat allotment process. Detailed information of AUCET 2nd round and 3rd round seat allotment has given below. Initially, visit the official website of AU, audoe.in. On the homepage, AUCET 2nd round allotment result link will be displayed. Download AUEET Seat Allotment List 2018 [2nd phase] and take a printout for further reference.